Since their relatively recent inception, state discourse across the Gulf has been framed around the mantra of ‘the protection of the past while moving forward’. Heritage has been an essential component of this framing and its importance gets revived in different forms each time the state crosses a new stage of development. Established through common stories, myths and the shared life experiences among its populace, Anderson (1999) conceptualises nations as ‘imagined communities’ where individuals profoundly construct a mental image and belief of their sense of collectiveness within a nation. He asserts that individuals, who live in a collective, territorially-bound region, deeply conform to a unified image of themselves within a nation in a globalised world. Without such ‘national character’ (often state-articulated in the sense of common culture, shared values and traits), the modern nation-state could not functionally exist and survive in a contemporary society. This perspective not only views the nation as a form of a socially constructed entity, but also determines its governing national identity and social reality, as profoundly imagined, exercised and sustained by the citizens who perceive themselves to be part of that collective group. This process is essential in understanding the emergence and survival of the modern nation-state, and has become a crucial lens used when assessing the historical and contemporary experiences and collective memories of the people of the community. The case of the UAE, like some of its Gulf neighbours, is uniquely complex, given that national construction and processes of nation-building, heritage and identity have largely remained dynamic. Hertog (2016) asserts that ‘state-building [in the UAE and the Gulf countries] was based on rent distribution rather than capitalist growth, resource extraction, war or national struggle.’ Therefore, conventional class and identity formation processes have not occurred in the Gulf. Both state and society were fragmented, but oil eased the development of the state as the stronger element in the equation. In a globalised world, the state in the UAE has consistently attempted to develop a hybrid approach of state-building and modernisation. It combines Western and Gulf notions of modernity whereby traditions, cultures, identity and heritage are contextually taken into account, while simultaneously preserving the core of their sovereign local cultures embedded in their national institutions, policies and governance models. He further adds that, unlike other Gulf neighbours, the UAE represents a partial exception because ‘modern state structures exist both on the Emirate level and the federal level, giving most UAE nationals a twin identity’ whereby the ‘flow of resources from state to society have eased the relationship of patron/client’. 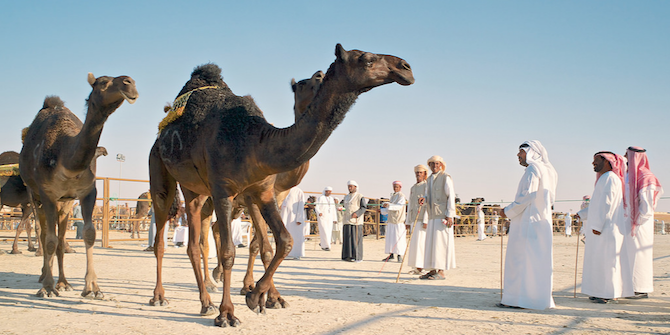 While constructively engaging both at regional and global levels, the UAE state has, in fact, continuously articulated and (re)produced its national heritage and identity – as part of its nation-building efforts ­­­– by embedding its history, culture and tradition in its governing institutions, policies and practices at the national level. In fact, with substantial continuous growing wealth, the UAE has constructed a top-down, centralised state institutions to govern national heritage and culture, while engineering and reinforcing the emerging role of the state as a ‘gatekeeper’ or ‘power-broker’ in linking the local citizens/populations with the nation. This political strategy has also reinforced the ‘historical loyalty’ of local citizens by advancing both their economic and cultural empowerment at the national levels (Heard-Bey, 2005). In addition to this top-down approach, the UAE state has strategically designed grassroots initiatives – spanning from the areas of sports, politics, labour markets and culture – to better emphasise the ‘caring character’ of the state with the local community. By introducing various national reforms, including but not limited to the ‘gender-balance’ in the UAE parliament and other government entities, nationalisation (indigenisation), expansive/generous social welfare reforms, mandatory national military service, the state is not only engendering both the symbolic and material benefits of nationhood for its local citizens, but also broadly signalling the referential power (role of institutions, power, devices, and strategies) and dimension of collective national identity and power under its formations (Koukutsakki-Monnier, 2015). Apart for the aforementioned dual approaches to nation-building through its national identity and heritage, the UAE state has also increasingly attempted to bolster central Emirati values, including happiness and tolerance. In fact, the state construction and institutionalisation of happiness ­– codified under the establishment of the Ministry of Happiness – as part of the citizenry’s everyday life has not only reinforced the UAE state’s holistic approach to national identity and heritage, but also legitimised the protective nature of the governing state (Sabban, 2018). By constructing such state-led megastructure projects, institutional reforms and strategies, the UAE state has articulated its nation-building/nation-branding approach while simultaneously engineering its national identity. In response to globalising forces, modern states like the UAE and other Gulf states have increasingly devised complex instruments to promote state-led nation-building projects to control the historical (and future) loyalty of its people. By articulating a nationalistic ­– and in some cases, populist – rhetoric, coupled with significant symbolic and material benefits associated with the state ideology, modern nation-states were not only able to subject and promote national identity through shared cultural heritage and belonging, but also maintain sovereign control over their nation’s historical and contemporary development process. The governing state instruments, including laws, institutions and strategies are not only vital instruments of the nation states to embed and influence their local populations’ ideological beliefs, but also reflect their strategic political behaviours in maintaining sovereignty against the increasingly powerful forces of globalisation in the twenty-first century. Rima Sabban is an Associate Professor of Sociology and currently the Assistant Dean for Research and Graduate Studies at Zayed University. She is the author of Maids Crossing: Domestic Workers in the UAE and Motherhood: Experiences of an Arab Woman.